Arutz Sheva talks with students on joint BIU/YU summer program to hear what they're learning about science and Israel. Arutz Sheva was on scene to speak with some of the undergraduate science majors taking part in the fifth annual Summer Science Research Internship Program, a joint initiative between Bar-Ilan University (BIU) and Yeshiva University (YU). Of the participants 23 are from Yeshiva College, and four others are from Cornell, Touro and Queens college. During their seven-week experience in Israel on the program, they will get hands-on experience and learn from some of Israel's top scientists. Students are taking part in internships at BIU's laboratories with faculty members from the Bar-Ilan Institute for Nanotechnology and Advanced Materials, Gonda (Goldschmied) Multidisciplinary Brain Research Center, Faculty of Engineering, Mina and Everard Goodman Faculty of Life Sciences, and the Departments of Mathematics, Chemistry, Physics and Computer Science. "As always, the quality of students from Yeshiva University and other schools that are with us this year is very impressive. Over the years the students have integrated very well into our labs during their brief stay such that the Bar-Ilan faculty who have hosted them have been quite pleased," said Prof. Ari Zivotofsky of BIU's Interdisciplinary Brain Sciences Program, who is overseeing this year's program. "It is particularly impressive that women comprise the majority of this year's group. This will allow us to drive home the message that observant Jewish women can thrive in the sciences in Israel, at the same level as their male counterparts," added Zivotofsky. Zivotofsky matched students with mentors and research assignments based on their past academic work. The program focuses on lab work, but also features trips to scientific and industrial sites around the country, such as IAI (Israel Aerospace Industries) and the laboratories of the Agriculture Research Organization (Volcani Center), as well as a series of lunch meetings with BIU faculty speakers. "This unique internship program allows undergraduate students with a strong background in the sciences to experience a nurturing, interdisciplinary research environment and to develop their basic research skills," said Prof. Harvey Babich, Chair of the Department of Biology at Stern College for Women. "In addition, it increases the positive visibility of Israel and strengthens the very special bond between Yeshiva University and Bar-Ilan, encouraging faculty to pursue collaborative projects and visit each other's campuses to share their research interests," added Babich. 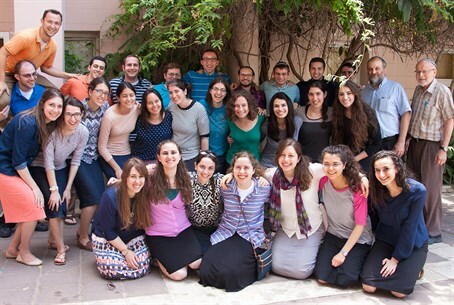 In order to balance their science studies with Jewish studies, the students every night hold chavruta group study sessions, and also attend Torah classes at the Caroline and Joseph S. Gruss Institute kollel in Jerusalem. The students on their own initiative decided to try and learn an entire tractate of the Talmud over the summer by learning on their way to and from the internships.